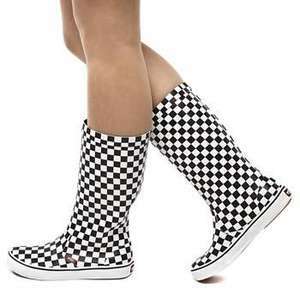 Womans Vans Checkerboard Wellies £17.99 delivered with code @ schuh! Really cool womans van wellies, just ordered the missus a pair. At time of posting 3, 4, 5, 6, 7 in stock. Use code welcome10 for this price. Thanks ordered. Quidco is 6% by the way. Good deal. My mate got some for his wife, he's taking her to the first F1 race of the season, hoping Sebastian Vettel will see these and run her over. Ordered them the other day. My bf said he won't go out with me wearing these. Don't care, I was tempted at £55 so £18 is a great deal! Good deal. My mate got some for his wife, he's taking her to the first F1 … Good deal. My mate got some for his wife, he's taking her to the first F1 race of the season, hoping Sebastian Vettel will see these and run her over. Ordered. What a great find. That's exactly what Vettel said as he mowed her down. Thanks I bought myself a pair and I'm very happy with them indeed. The delivery was quick and painless too. Would definitely recommend if your looking for a sturdy yet stylish wellie! Thanks I bought myself a pair and I'm very happy with them indeed. The … Thanks I bought myself a pair and I'm very happy with them indeed. The delivery was quick and painless too. Would definitely recommend if your looking for a sturdy yet stylish wellie! I went out in them today walking the dog and I did slip a bit in the mud but there ok if its not too muddy.. or icy haha. Good for the price but definitely wouldn't have paid full price for them.